Scott Schuman, otherwise known as The Sartorialist, may have inspired me to start TorontoVerve, but it was the talented Fred Vielcanet of Easy Fashion Paris, who motivated me to take better pictures. It’s impossible to talk about the best street style photographers in the world without mentioning Fred. His street style photos are always brimming with colour, life and, of course, chic. While in Paris last month, I had the good fortune to sit down with Fred to talk about his life, success and the business of street style. Fred Vielcanet: First, I must admit that I haven’t visited your blog in a long time. I had a look 2 days ago and I find your pictures very impressive. I like your choice of people in Toronto. TorontoVerve: Thank you very much. I appreciate that. So tell me - what did you do before Easy Fashion Paris? FV: For twenty years, my full time profession was photography and journalism. I discovered blogging about 6 years ago. I’m from the old school so when I started I didn’t know what I was doing. Since it wasn’t my main occupation, I was very slow updating my posts, but now, the blog is starting to be profitable for me with the occasional magazine job. I feel I can do much better with the blog, but with so little time -- I do what I can. It’s all a matter of timing. If I had started blogging a year before I did, I think I would have been more successful at it. But it was already too late. Overall, I think that the popularity of fashion blogging is coming down now because every day a new fashion blog or social media, like Pinterest, pops up. I’m a victim of Pinterest. Pinterest people take my pictures and they don’t even credit me. They just take the pictures and run. TV: You don’t like Pinterest? FV: About 4000-5000 of my pictures are on Pinterest with no feedback or anything. It brings me nothing back. 2 or 3 years ago, approximately 100,000 visitors viewed over 200,000 pages on my blog a month, but now I see half of that, and I know that happens to other bloggers too. Some people also copy my blog. They change a letter in the address and they sell advertising. I have a few clones from Asia. But I still go on. TV: Where are you a journalist? FV: I’m a freelance writer for 3 or 4 magazines and professional newspapers. I write stories about tourism, health, security and restaurant reviews. And I always take my own photographs because I can. TV: Is it hard to make a living as a photographer now? FV: Yes, it’s very hard. I was able to do it for 20 years, but now it’s nearly impossible. TV: Why is it impossible? FV: Well, the fact that everyone seems to be a photographer is a big reason. They buy a camera last week and then they say, ‘hello, I’m a photographer.’ Plus a lot of people give away their pictures for free. Magazines would rather use free bad pictures than to pay for good ones. What can you do? TV: How do you choose your fashion subjects? FV: I get a lot of my photos during fashion week in Paris. You have a lot of trendy people in one place -- outside the shows on the Champs-Élysées, Le Grand Palais where the Chanel show takes place, and Les Tuilleries. It’s very different than shooting regular street style. The fashion is more exotic and expensive. In the streets, I’m looking for the complete silhouette. It’s not always about the clothes, but the way they move. TV: Which camera do you shoot with? FV: Today, I have my Nikon D4, which I use for my regular work -- not blogging. I own 3 cameras and I usually shoot street style with my Nikon D3s. TV: How long does it take for you to shoot someone’s street style? FV: A very short time. Sometimes just 2 minutes. Depends on the person. Sometimes, people are very nervous and I have to talk with them for awhile so they feel more comfortable. TV: How receptive are the people when you ask to photograph them? FV: First they are surprised. They often ask, ‘why me? I’m not even well dressed today.’ And I tell them I chose you because I like your colours. It doesn’t matter if they’re wearing H&M. TV: What do you like most about shooting street style? TV: What do you like the least about street style? FV: I don’t like it when I stand for hours and I find nothing. It’s like a fisherman who waits on the river and nothing happens, but I mostly like shooting street style. Soon Paris Fashion Week is starting and every year I tell myself I’m not going because I’m too tired of all the commotion. Most photographers have no respect for each other and when I try to take a picture, someone with a smartphone is in my shot. TV: When you’re at these fashion events, what are the fashion editors' and designers' attitudes about getting photographed? FV: Depends on their state of mind. I think a lot of people in the fashion world know that they have a lot to gain by appearing on fashion blogs. It gives them a great opportunity to be known all over the world. TV: Do these famous people recognize you at these shows? TV: I ask because everyone seems to be posing for you in your photos. FV: During fashion week, they’re a lot of people around me and we’re taking the same shot. Sometimes I get good pictures -- sometimes better than everyone else. I try to be better, but occasionally I fail. I like blogging because I’m free to do what I want to do. When I work for a magazine, there’s always someone to tell you to do it another way. When I blog, I’m free to be good or bad -- even very bad (laughs). Lastly, I’m very happy getting the contacts that I have through the blog. Sometimes I sell pictures from my blog to magazines in Russia, Germany, Korea, United States, Italy and Spain. That’s the great thing about the internet. TV: What is your most memorable time shooting street style? TV: How well do you handle the rejection? TV: How would you describe Paris street style? FV: A lot of people ask me that question. It’s very eclectic from place to place, but half the time, the people who appear on my blog are not Parisian. They come from other countries. In the winter, a lot of people dress in black, which is very boring. So I have to wait until Spring for all the colour to come back. TV: How would you compare your street style blog to others? What sets yourself apart from them? FV: I cannot say that I’m different because I didn’t invent street style. I’m happy to manage a blog that shows the people of Paris. I feel like I’m a member of an International club of bloggers -- like you. 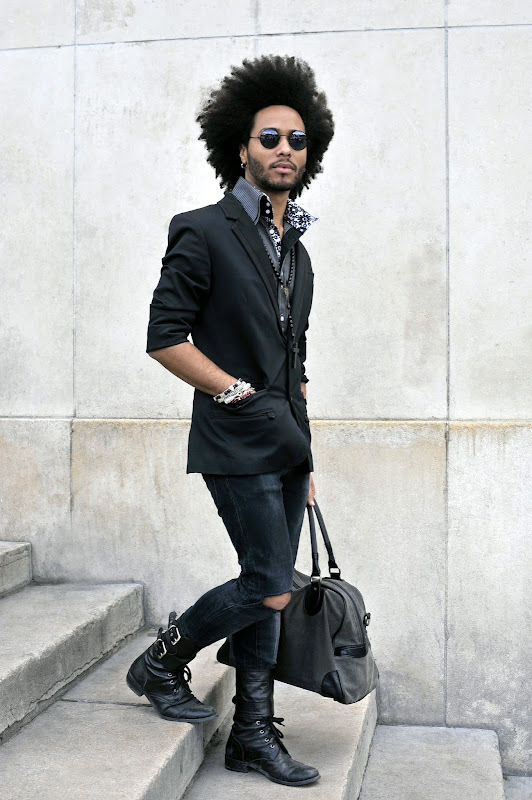 One of my favourite street style bloggers is Wayne Tippetts of Street Style Aesthetic in London. TV: Are there any other street style bloggers who inspire you? What about Scott Schuman, the Sartorialist? FV: You want my true opinion about Scott Schuman? FV: He is the kind of person who never says hello. I see him about 4 times a year and he never says hello to me. Once he interrupted one of my shots because he said, ‘I’m going inside the show. Let me take a picture first,’ and he pushed me away. In my opinion, his girlfriend, Garance Doré is a more talented photographer than he is, but he’s very skilled at marketing and managing his career. TV: You mentioned it’s all about timing. He’s a very popular street style photographer. Perhaps timing was just right for him. FV: He was sort of the first. Yes, timing is very important. In the beginning, there were very few street style blogs, but now there are hundreds. It’s nearly impossible to stand out in the crowd. I believe there are about 20 street style bloggers, who are exceptional around the world and maybe Scott Schuman is one of them. TV: Does he know about you and Easy Fashion Paris? FV: I don’t care. Scott Schuman and Garance Doré are far from the [average] street style blogger. They are now a part of the fashion circus. They go inside the show and have their own place to shoot. They are not like us anymore. TV: So you’re saying that they’re not genuine street style bloggers? TV: Paris Fashion Week is just around the corner. Will you be going? FV: Sometimes I think about giving up fashion week and just shoot street style, but the problem is that most magazines prefer buying my fashion week photos. There are also a lot of fashion students who come to the shows to get photographed for fashion blogs so it’s hard not doing it. TV: How much longer do you think you’ll be shooting street style for Easy Fashion Paris? FV: I like blogging, but it takes a lot of my time, and it’s hard to compete against full-time bloggers. TV: Yes, I’m shocked that full-time bloggers can make a living doing it. FV: Oh, they have money. They don’t need to earn a living. I see bloggers go to Milan, London, New York, Paris and Sydney for an entire week. They’re paying for their flight, food and hotel. They’re always taking pictures with their expensive cameras. It’s all strange. Very strange. * Street style photos courtesy of Fred Vielcanet, Easy Fashion Paris. thank you and Fred for your dedication in capturing moments that are beautiful and fleeting. I hope to be in Toronto one day ! Thanks Fred for such a candid and honest interview, keep up the great work! Great Street Style Q&A, it's the nitty gritty truth of being a fashion photographer.